Tell me you truly love me before I give you my heart to hold. I don't want you to turn me around and stab me in the heart I once had. Being scared isn't a sign of weakness, not admitting you were scared is. Admit your failing .Don't worry over them,'but confess them. 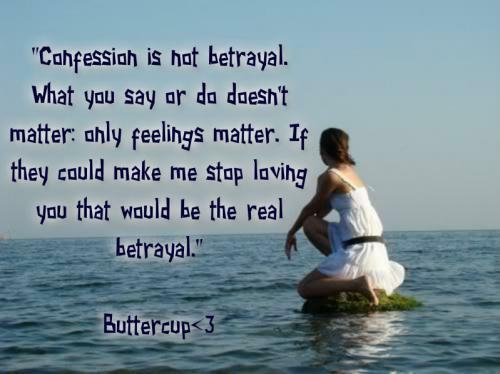 Confession is not betrayal, what you say or do doesn't matter. Only feelings matter. If they could make me stop loving you that would be the real betrayal. Telling someone you love them doesn't necessarily mean you can expect an I LOVE YOU TOO! in return sometimes you just have to tell people what you feel, because feelings are meant to be set free, not kept locked away inside our heart. You said, I love you. I said it too. The only difference is, I didn't lie to you. Don't wait until its too late to tell someone how much you love how much you care,because when they're gone no matter how loud you shout and cry, they won't hear you anymore. If you love someone tell them. Forget about the rules of the fear of looking ridiculous. What is truly ridiculous is passing up on an opportunity to tell someone that your heart is invested in them. Confession is an act of acknowledging things. The word confession is basically referred to as act of admitting your mistakes. 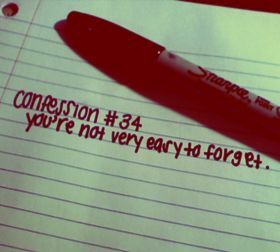 Confession can be admitting any feeling too like your love, dislike, expression, thoughts etc. Confession is no more restricted to admitting your mistakes or sins for that matter. “A guilty conscience needs to confess. A work of art is a confession." These are the words of Ludwig Wittgenstein. He has suggested that even a work of art is nothing but a confession of thoughts, ideas and imagination by an artist.